Effexor is the brand name for venlafaxine, which is a selective serotonin and norepinephrine reuptake inhibitor (SNRI). SNRIs function as antidepressants, by increasing the number of neurotransmitters in the brain and preventing the uptake of norepinephrine, which helps to maintain chemical balance in the brain. In 1993, the U.S. Food and Drug Administration approved Effexor for treatment of depression and it is the first SNRI and one of the most commonly prescribed antidepressants. By 2009, Effexor was the 12th most prescribed antidepressant in the United States, with over 17 million prescriptions. 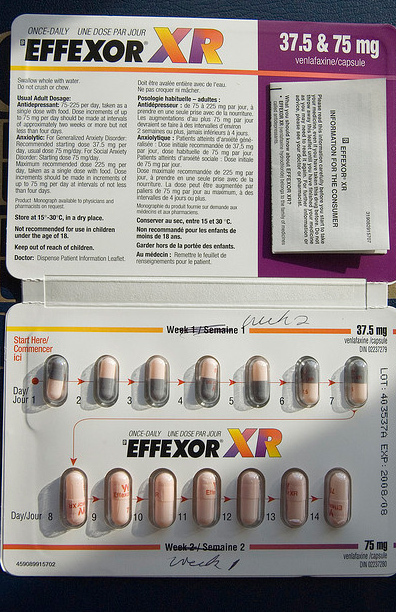 Effexor was originally introduced by Wyeth but is now manufactured and distributed by Pfizer. Several pharmaceutical companies such as Anchen Pharms, Dr. Reddy’s Lab, Mylan and Teva are licensed to market generic form of Effexor. Effexor is available in tablet form in 25 mg, 37.5 mg, 50 mg, 75 mg, and 100 mg. It is also available in an extended release formulation (Effexor XR) dispensed as capsules in 37.5 mg, 75 mg, and 150 mg. Effexor is also available in generic form as venaflaxine hydrochloride. Because of its ability to regulate brain chemicals associated with mood disorder, Effexor is used to treat a variety of different manifestations of depression. These include major depressive disorder, generalized anxiety disorder, and comorbid anxiety disorders (which are those that demonstrate symptoms of multiple disorders at once). It may also be prescribed for the management of symptoms of anxiety due to social phobia (social anxiety disorder), panic attacks (panic disorder) and generalized anxiety disorder. Your healthcare provider may prescribe this medication for conditions not listed in this drug information. Take this medication only if prescribed by your healthcare provider. Do not share prescription with others even if their symptoms or medical condition appear to be the same as yours. Effexor may increase the risk for suicidal ideation or actions, especially during initiation of treatment or dose adjustment. Individuals taking this medication are advised to report any sudden changes in behavior, mood, feelings, and thoughts. Watch out for signs of serotonin syndrome or neuroleptic malignant syndrome such as agitation, restlessness, rapid heartbeat, increased body temperature, changes in blood pressure, hallucinations, diarrhea, overactive reflexes, lack of coordination, nausea, and vomiting. These are possibly life-threatening side effects, so contact your healthcare provider right away. Monitor your blood pressure while taking this medication, especially for patients with history of high blood pressure. Effexor may decrease blood sodium levels or hyponatremia. Report any signs of this condition such as difficulty concentrating, headache, weakness, confusion, hallucinations, loss of balance, falls, and seizures. Effexor increases the risk for seizure to develop. Inform your healthcare provider if you have history of seizures. 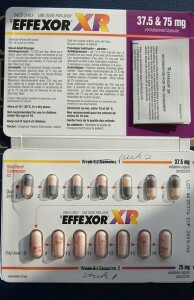 Effexor increases the risk of bleeding. Avoid taking aspirin, blood thinners (heparin and warfarin) and nonsteroidal anti-inflammatory drugs (NSAIDs). Effexor may increase blood cholesterol levels. Your healthcare provider may recommend regular monitoring of your cholesterol levels, especially for patients on long-term treatment with Effexor.